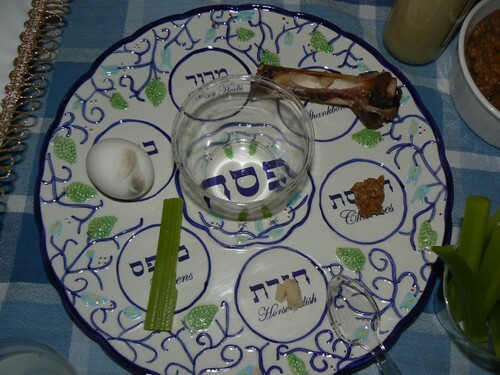 Each year Passover preparations begin long before the holiday is actually here. We are religious enough that we change out our pots/pans and from pure laziness use disposable silverware/plates. We put all of our chametz into one area and use certain cabinets that have been readied for Passover. 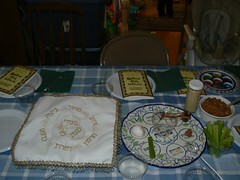 This year we thought about what to make for Seders in case we had them at home. It was a good thing since we found out the Sunday before that we would be doing them at our house. 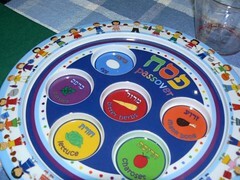 Our boys have no clue what is done behind the scenes for Passover. I have to admit that I did not realize much of this until I met JL. 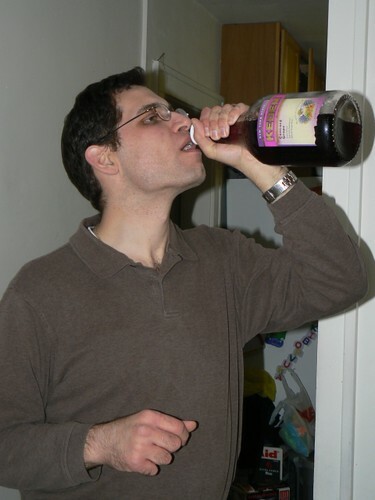 Sure, my relatives did all of these preparations, but I only recall going to their homes for the Seders with the rest of the extended family. When all was said and done we were ready to go for both of the Seders last Wednesday and Thursday. We made chicken, sweet and sour turkey meatballs, oven roasted sweet potatoes, cauliflower and the traditional items for the seder itself (hard boiled eggs, gefilte fish, and charoset). We ran out of time to make matzah ball soup, but added an amazing quinoa dish for the second night. 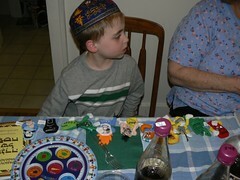 Now I welcome you to our table to see how my family celebrated at our Passover Seders last week. Here are two views of our table. The boys are lucky. Aunt S and Uncle M bought them some amazing fun items to have during the Seder. 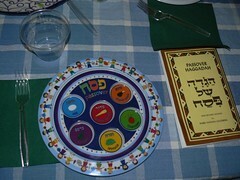 Check out NHL’s place at the table and a closer view of the kid’s Seder plates. Check out all of the extra items that they also received. 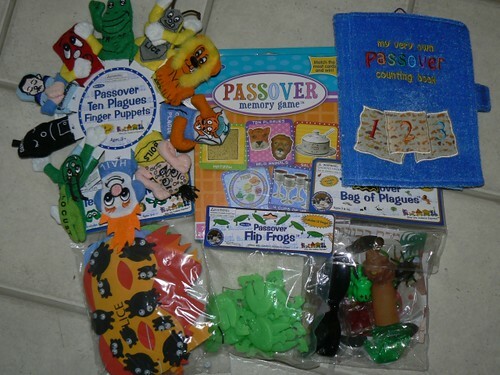 There are the Passover Ten Plagues Finger Puppets (great to go along with the 4 Question Finger Puppets that we already had), Passover counting book (adorable for JSL), Passover Memory Game, Bag of Plagues, Flip Frogs, and 10 Plagues masks. 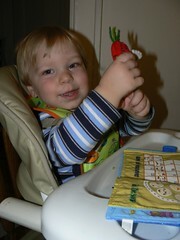 More about the 10 Plagues Finger Puppets coming tomorrow for Wordless Wednesday. The boys enjoyed trying most things. 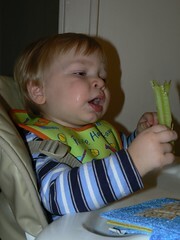 Here they are eating the celery dipped in salt water. While NHL was busy getting the 10 plague finger puppets in order for their part in the Seder, JSL had fun playing with the 4 Questions. NHL even started singing in Hebrew showing us that he has learned a lot at Hebrew School already. 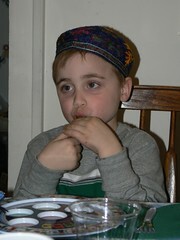 Our only little glitch in the Seder was when JL got quite ill. He had a little too much horseradish along with his wine and turned quite white with massive hot flashes. We finally turned on the fan and he felt better. Of course this photo taken earlier is a little funny looking back at it. 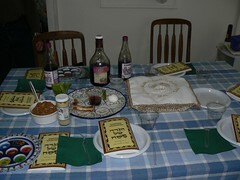 Overall, we had two nice Seders at our house. It was great ,having our boys, Nana, Papa and Aunt T here with us. Still, it will be nice in the future to be able to celebrate with more of our extended family.